Pamplin Media Group - Is six-man football the answer for small schools? Is six-man football the answer for small schools? In 2015, the Mitchell Loggers finished their football season with a 3-9 record. It was the last year that the Loggers would field a team of their own. Struggling with enrollment issues, the Loggers combined with Spray and Wheeler County to field a team the following year. Playing in Special District 4, the new team, the Rattlers, struggled to a 2-6 record. In their final game of the season, the Rattlers fell 62-7 to the eventual state champion Dufur Rangers. The Rangers scored not just on their first seven possessions, but on the first seven plays where they touched the ball, scoring on the opening kickoff, three passing touchdowns, two rushing TDs, and a defensive touchdown in the game's first six minutes. Following the outburst, the Rangers didn't play their starters again, at least not at their normal positions. Following that game, Dufur head coach Jack Henderson, who is also the school district's superintendent, noted that it was difficult to schedule competitive games, observing that there were just a handful of schools in the state that were good enough to allow his starters to play an entire game. 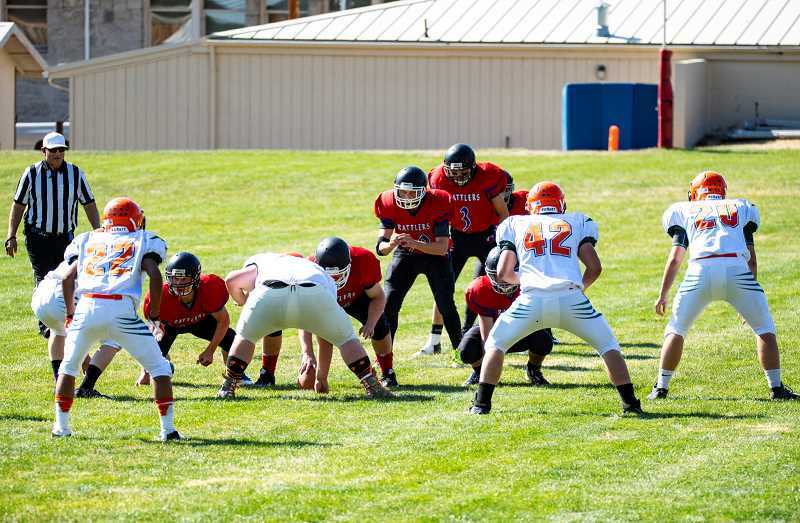 During the season, there were rumblings that a group of Class 1A coaches and athletic directors had gone to the Oregon School Activities Association (OSAA) requesting that Class 1A play six-man football rather than eight-man. Henderson was emphatically opposed to the idea. "We have trouble getting playing time for our starters now," he said. "If we drop to six-man, there will be even less field time for them. We would rather move up to 11-man football and take our chances. But it would be fine if they dropped some of the smaller schools to six-man, provided they can find some way to make the scheduling work." Dufur went on to also win the 2016 and 2017 state championships, and the Rangers are ranked No. 1 and are undefeated again so far this year. Meanwhile, Mitchell/Spray/Wheeler head coach Jerry Anderson was quick to say that from their perspective, six-man football would be a possible solution to the competitive imbalance that was hurting Oregon's eight-man football. Outscored 309 to 21 in their 2016 league games, the Rattlers elected to play an independent schedule in 2017. South Wasco County, a once proud Big Sky League power, also dropped out of Special District 4, citing a lack of players. For Dayville/Monument, the situation was even more difficult than for Mitchell/Spray/Wheeler. Following a 1-8 record in 2015, the two schools dropped football entirely in 2016. The Tigers failed to field a team again in 2017, while the Rattlers did better playing an independent schedule, improving their record to 3-3 on the year. During the course of the 2017-2018 school year, the OSAA worked on school realignment, something the organization does every year. However, this time they also worked to address competitive balance. As the school year wound down, the OSAA appeared to be close to not only finalizing what teams were in what classification and leagues, the organization was poised to make several major changes for the 2018-2019 school year. Some of those decisions may ultimately change the face of football in Oregon, possibly forever. Among those decisions, the OSAA gave Class 1A schools the choice of playing either eight-man or six-man football for the next two years on an experimental basis. Teams choosing to remain in eight-man football will still have a state championship, while teams opting to play six-man will not have a playoff during the two-year period. Despite not being eligible for post-season play, 15 schools or co-ops (more than one school playing together) opted to drop down to six-man football. Among those schools was Dayville/Monument, which resurrected their football program, and Mitchell/Spray/Wheeler. "As far as competitive balance, we are in a better spot with this group of six-man teams than we were last year," Spray athletic director Dennis Starr said recently. "It's a lot more like a playground game than it is a football game at times. It's almost like they are drawing it up in the dirt, but it's neat the way they've been able to adjust to the quarterbacks not being able to run and how you get your best athletes the ball." To be fair, the quarterback is allowed to run with the ball. Six-man rules allow any player on the field to carry the ball or to be eligible for a pass. However, whoever the ball is snapped to may not cross the line of scrimmage, there must be a clear exchange of the ball, a handoff, lateral or forward pass before the ball may cross the line of scrimmage. Other rule changes from more traditional football make six-man football a very different game. Instead of 50 yards wide, the field is only 40 yards across. Typically a six-man field is 80 yards instead of 100, however, during the OSAA two-year experiment, fields have been left at 100 yards in length in order to keep schools from having to move their goal posts. Teams must gain 15 yards for a first down instead of 10. In addition, a field goal is worth four points, while an extra point run or pass is worth one, and a kicked point after touchdown is worth two. In addition to rule changes, the game tends to be more wide open. "It was a big learning curve for us," Anderson said. "But the OSAA put on a clinic for us, and all of the six-man coaches were able to go and learn from five or six of the best coaches in Montana that have been playing six-man for a long time. Let me tell you, we learned a lot." Whether the change is going to save football in rural Oregon remains to be seen. However, so far it seems to have been well received. Perhaps the most interesting story concerning the switch to six-man football is the case of Burnt River High School. With an adjusted enrollment of 23 students, Burnt River attempted to play six-man football this year using only foreign exchange students on their roster. With just six players, the high school from far Eastern Unity played the first four games of the season before finally having to cancel the remainder of the year. Although they are an extreme example, Burnt River is far from the only rural Oregon school which utilizes foreign exchange students in order to field teams. Mitchell High School, with an adjusted enrollment of 27, runs a dorm that is primarily filled with foreign exchange students, part of a growing trend that enables some of the smaller schools to remain viable. "We have so many international kids, they make up a third to half of our team each year, and they are new to football, so we can't get too fancy with our plays," Anderson said. 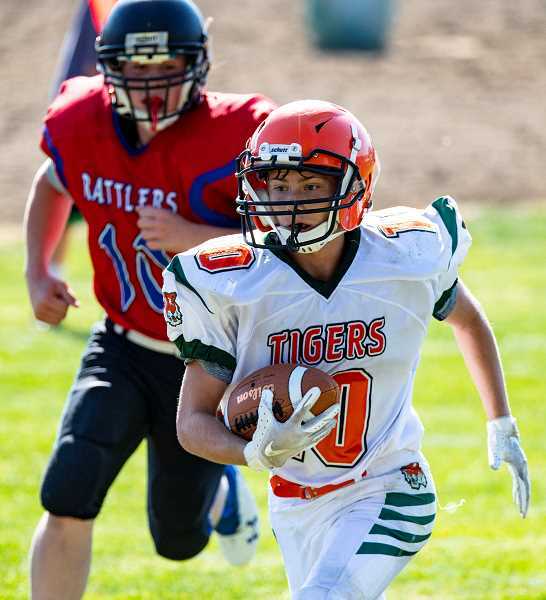 Anderson is excited because the Rattlers currently have four middle school students who are playing football, meaning that if they continue to play next year, they will immediately have some players with football experience. "We are real excited to have some local kids so that we can do the same thing and not have to start over again every year," he said. The situation at Dayville, 14/Monument, 18, and Mitchell/Spray, 19/Wheeler, 14, is not unique. Lots of schools co-op in different sports in Oregon. However, the distance players have to travel for practice makes the situation unique for those schools. Mitchell is 45.5 miles from Wheeler High School and 35.5 miles from Spray, while Wheeler High School is 32.2 miles from Spray High School. That means that players from two of the schools travel for nearly an hour each way in order to practice each day. The three schools rotate practice fields in an attempt to make travel time as equitable as possible. Dayville/Monument has a similar situation with 39 miles between the two schools. Yet the schools still are eager to field teams and all believe that six-man football may be part of the solution that they have been looking for. "I think it's been great," said Dayville/Monument head coach Kyle Hand, following a close loss against Mitchell/Spray/Wheeler. "Even today, if we were playing eight-man, we wouldn't have had a team. We had eight or nine suited and we finished up with seven." "When we were first asked if we wanted to do this, I said, 'Yes, sign us up,'" he said. "Even though we are having to co-op with three high schools, six-man is still better for us than eight-man." Six-man football is a wide open game, and consequently, is quickly becoming popular with players. With every player eligible on every play and so much space on the field for so few players, every play is a potential touchdown. "I like how fast the game goes," said Rattler quarterback Bob Nicol. "There are so many open windows now with six-man, and for these smaller schools, it's a lot better because we are short on guys." Tiger lineman Cade Milton, a 265-pound center who caught three passes in the Tigers' 24-13 loss to the Rattlers, agrees. "It's a change," he said. "It's hard because you have to really work at it to keep up with some of these small kids, but it's more fun," he said. "There's more hitting. You can catch the ball and actually run it even if you are a lineman and everything." "It's changed the game completely," Tiger running back Gabriel Walker-Hopkins added. "It's a lot faster pace, and it's brought our team a lot closer, too." Rattler running back Isaiah Matney is one of the few players who has played 11-man football, eight-man football and now six-man football, and he is a fan of the new game. "I went from 11 to eight to six, so it's pretty great because speed is definitely one of the keys, and we have a lot of speed on our team," he said. "I like how open the game is, but I wish that the sidelines were a little bit wider so I could use my speed even more." Both players and coaches hope that the OSAA will allow schools to continue playing six-man following the two year trial period. "I hope that they continue after I leave because I feel like this is a great win for every small school," Nicol, a senior said. "Competition is still the same," Walker-Hopkins added. "We all still want to win, and we hate losing. We all work hard no matter what, but I'm thankful for my team being with me for my senior year and the chance to play." When asked what changes, if any, they would like to see the OSAA make, both Hand and Anderson had some thoughts. "We need a state championship," Hand said. "I think it's great, but we need to make sure that we have the right teams playing six-man." Starr agreed that making sure that the right teams are playing six-man is important. "I think that right now there are some more teams that are thinking that maybe they should drop down to be in six-man," he said. "And there are a couple of teams that I think maybe should still be playing eight-man." "In my opinion, the OSAA would be silly to go back to eight-man," Anderson said. "All of these six-man schools would struggle to go back up to eight-man again. These kids should have a state championship, or at least an all-star game." Both Hand and Anderson believe that rather than letting schools choose whether they play eight-man or six-man that the OSAA should have a cut off based solely on attendance. "It's all about attendance," Hand said. "Keep it going. Make sure that the bigger schools are still playing eight-man, and start a state championship. Skill has nothing to do with it. It's all about school enrollment. You can't control athletic ability." "I would rather have a hard cutoff," agreed Anderson. "We have 15 or 16 kids out for football. Four of them have played football before. Two of the others understand it, and the others are brand new to football. But that doesn't matter. Even though we rely on international students, the OSAA should still decide who plays six-man based on the numbers." Starr added that although there is no playoffs this year, the OSAA is allowing the six-man teams to move ahead with a post-season event. "We are looking at taking the top three teams from each side and meeting in Gilchrist to do an all-day event following the season," he said. "And the ADs have put out a thing to talk to the coaches about doing an all-star meeting even though the OSAA is not going to recognize it." Regardless of whether the OSAA continues their six-man experiment or not, right now it appears to be a big hit. Lots of scoring. Varied formations and plays. Teams getting a chance to play that probably would not have had football otherwise. So far, it looks like a big success. "We are just happy that we have kids out here that like to play football," Anderson said. "The six-man game gives us the opportunity for them to have a good time and to play competitively against other schools and other teams that are in similar situations. I'm very thankful."